Well Fashionistas, it’s time once again for me to share with you my Old Navy picks of the month. If you read last month’s post, Dress for Less at Old Navy, you’ll recall that I was thrilled to become part of the Old Navy Blogger Subscription Program. It’s pretty simple: Once a month, Old Navy sends me a $100 gift card to use at OldNavy.com or in an Old Navy retail store. In return, I share with you the details about my purchases along with my honest opinions – whether good or bad. Last month, I used up my $100 gift card on a gorgeous Brown, wool-blend, double-breasted coat ($89.50 plus tax). So this time my plan was to zip past the outerwear section and head straight to the denim area. After all, you can never have too many pairs of jeans. ;-) So much for that idea! As it turned out, I abandoned my plan within a few seconds of walking into the store. There before me, prominently displayed on one of the front entrance mannequins, was an eye-popping Orange pea coat (see photo immediately above). With its cheery color and classic cut, I fell for it right away. Don't those visual merchandisers and in-store stylists earn their keep!!! Although there were plenty of hues to choose from, including Black, Navy Blue and a Cream / Gray Plaid, I opted for the Orange, aka “Golden Gate” as it was described on the Old Navy website. I have to admit that I own a LOT of coats and jackets, so I it’s not like I needed a new one. 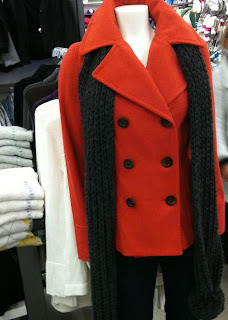 However, in a closet that is a sea of Black and Brown, I figured that Orange pea coat would add a welcome punch of color. I bought a size small and would say that this Old Navy wool-blend “prep coat” runs true to size. Since I can comfortably wear a blazer or a chunky knit sweater underneath, it might even run a tad on the large side. As with the wool-blend coat that I purchased last month, the sleeves are quite long as well. This was a selling point for me since I have very long arms and too-short sleeves are always a problem. Another selling point was the cute back-waist belt with double button detailing. Pea coats aren’t exactly cut to create a shapely silhouette, so the little belt gives it a nice feminine touch. This Old Navy prep coat is made of 50% polyester, 38% recycled wool and 12% other fiber with polyester lining. Regularly priced at $59.50, I lucked out and got it for the newly reduced sale price of $45. Having fallen hard for the whole mannequin display, I also bought the Black, chunky knit, pom pom scarf to complete the look (the photo immediately above shows the scarf in French Violet). Although 100% acrylic, this stylish scarf is surprisingly soft. It’s also super-long – more than five feet! (I adore long scarves because they let me play with so many different tying options.) For just $10, reduced from the regular price of $12.50, there was no way I could go wrong with this purchase. 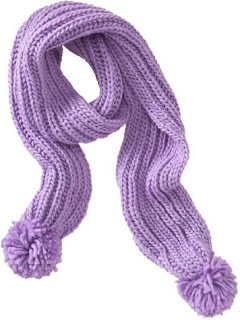 I chose the Black pom-pom scarf to complement the six Black buttons on my new coat, but the scarf is also available in Aqua Sparkle, Mole (Brown), Heather Charcoal, Royal Flush (Royal Blue), Warm Sunset, Bright Idea (a Neon-y Yellow Green), and, my personal fave, French Violet (shown above). My next pick was my best deal of the day. If someone had told me last month that I would be buying a pair of boots that cost only $15, I would have laughed and said, “You’ve got the wrong girl.” I’ll buy cheaper discount versions of just about anything – sweaters, tees, pants, jeans – but I’ve never been one to scrimp on footwear. 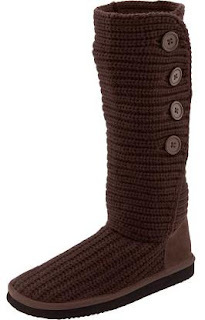 That all changed when I saw a rack of chic “sweater boots” in the middle of the store (see photo below). These boots, which are called “Adoraboots” (great name!) on the Old Navy website, come in Black, Dark Gray, Concrete and Brown. They have the look of a chunky rib knit sweater and open on the side with four buttons that are simply too stylish to be hidden under a pair of pants. I bought the Brown boots to go with my Old Navy Brown coat (purchased last month) , and plan to wear them with leggings or skinny jeans, tucked in to show off the buttons and rib-knit of course! I typically wear a narrow size 7, and these fit me perfectly. On sale for $15, they are regularly priced at $34.50. I don’t expect them to last more than a season, but that’s okay. So what if they’re not an investment piece? They’re trendy, fun and comfortable. Sold! Now it’s confession time: Like coats and jackets, I own a LOT of jeans – not “a lot” as in “one for every day of the week,” but rather “a lot” as in dozens upon dozens. Over the years, I’ve built a denim collection that includes almost every designer label. Consequently, I’ve come to think of myself as a bit of an unofficial expert in this area. So, with my pretend credentials (“designer jeans expert extraordinaire!”) to back me up, I was excited to see what Old Navy has to offer. In short, there is pretty much something for everybody. Whether you’re looking for skinny jeans, boot cut, trousers, flared or denim leggings, chances are that you’ll find something you like for between $29.50 and $39.50. Right now, you can even get some styles, such as the Moto Skinny Jeans and the Diva Skinny Buttoned Jeans, both regularly $34.50, for just $14.99 on sale. 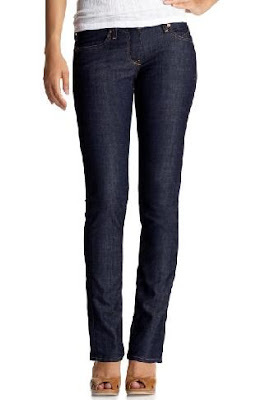 After looking through the many options available to me, I ultimately settled on The Diva Skinny for $29.50 (see photo above). It’s a classic, five-pocket style that comes in Black, Rinse, and, my pick, Dark Blue. While I’m not particularly tall (not quite 5’5”), my long legs require me to always purchase jeans with a minimum 34” inseam. At Old Navy, this means “long.” I bought a size 2 and am satisfied with the fit, although we’ll have to see how they stand up over time. They’ve been pre-washed for extra softness which is always a bonus, and I was happy to see that they have a bit of spandex (2%) for stretch. My only disappointment with the denim section was that there weren’t any jeans with back pocket detailing. Of course, they may have all sold out at my local Old Navy store. Anyway, I usually aim for some back pocket embellishment like raised buttons or intricate stitching because I have a less than ample rear view. In other words, whatever I can do to give my flat-as-a-pancake bottom some substance, I’ll take it! While my new Old Navy skinnies aren’t going to replace my fave booty-boosting designer jeans, they’re a good fit, comfortable, and definitely a good value. If you haven't already been disappointed by those jeans, I'd be surprised. Twice I have made the mistake of buying jeans at Old Navy. They lose their shape within a couple wears. They may have only cost me $20 each, but I'd rather pay $90 for one pair of jeans that kept its shape. You usually do get what you pay for. I sooo loooooove the boots. Stylish! I, too, would show it off.